Sorting out Sheol, Hades, Gehenna, the Abode of the Just, and Hell What happened to Christ after He died? What happened to Christ after He died? So let's use the word "hell" since that's our English word for it. No one was in heaven before Jesus came onto the scene. Everybody went to hell, but there were two areas of hell. St. Augustine taught that hell isn't a place per se, but rather a state, the absence of God and His love. It's more a spiritual state of being. Like darkness, which has no substance, but is just the absence of light. However, we kind of need to talk about these states of being like places in order to understand with our human minds. The Abode of the Just - Abraham's Bosom (Lk 16:22-26) This is where they awaited their promised deliverance. 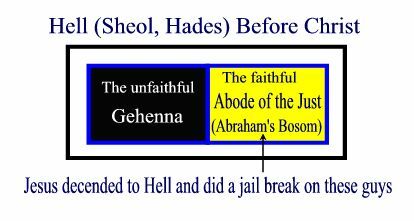 The good guys went to the Abode of the Just (Abraham's Bosom), the bad guys when to gehenna. There was a great chasm between the two places and there was no way to get to one side from the other. (Mt:18:9). Christ descended into hell on Good Friday so he could rescue the righteous from the part of hell where the righteous were. (1 Pt 3:18-19) Jesus is the only way to Heaven so it was important that he descended to the dead. (Jn 14:6) Jesus didn't go to hell as a dead guy. He went there as the Saviour. Jesus blew down the doors of the Abode of the Just and grabbed out every faithful servant of God from the beginning of history. He rescued them and freed them from this prison on Holy Saturday. Praise God! That must have been a great party. Jesus did not descend into hell to deliver the damned, nor to destroy the hell of damnation, but to free the just who had gone before him. [After Jesus' death] "the tombs opened and the bodies of many holy people rose from the dead..." (Matthew 27:52-53) Yeah, Jesus is the saviour of all humanity, even those from Old Testament times. No one was left in the Abode of the Just after Christ did the jail bust on Holy Saturday. After that Easter Sunday there was only one area of hell left. That's the lake of fire (gehenna). The folks in gehenna were lost for all eternity because they rebelliously refused God. Jesus didn't hang out with those guys during his three days in hell. Many still go to hell. Please Jesus keep me in your shadow! "The gospel was preached even to the dead." (1 Peter 4:6) The descent into hell brings the Gospel message of salvation to complete fulfillment. This is the last phase of Jesus' messianic mission, a phase which is condensed in time (3 days) but vast in its real significance: the spread of Christ's redemptive work to all men of all times and all places, for all who are saved have been made sharers in the redemption. The Good Thief was one of those freed by Christ from the Abode of the Just, just after his death. To be with Christ in His victory over death qualifies as "paradise" to me! (1) The first version, for Marchese Lodovico Gonzaga, Andrea Mantegna. This smaller one, which was probably done for Ferdinando Carlo, the last Duke of Mantua, around 1470–75. Lent to the Frick Museum, NYC from the Barbara Piasecka Johnson Collection. The conventional title given to the work, its workshop replicas and the engraving of it, Christ's Descent into Limbo, is a modern one. A full discussion of the biblical and traditional reasons Catholics believe in Purgatory is found here. Thanks to Fr. Terry Donahue for many of the insights in this article.